Fancy Nancy has a class assignment. First, she surveys family and friends to find out their favorite poem, and then, she and her classmates must write poems. What could be more delightfully fancy than poetry? With her fancy toga outfit, fancy writing paraphernalia and even a poetry palace club, Nancy is all set to become a poet extraordinaire! 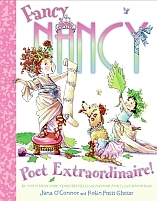 Fancy Nancy explores all the aspects of poetry from inspiration to the writer's block she faces. Will Fancy Nancy find the inspiration she needs? FANCY NANCY POET EXTRAORDINAIRE! makes poetry and its vocabulary not only accessible but downright fun. Jane O'Connor uses examples of rhyming poems and non-rhyming poems, nursery rhymes, limericks, greeting card poems, lyrics and odes to illustrate the variety of poetry. Even words like anonymous, inspiration, lyrical and anthology become meaningful from the situations created and the accompanying illustrations. Robin Preiss Glasser's illustrations are delightful! Jane O'Connor includes poems about everyday events and items such as eating pizza and even underwear that give the book a sense of humor that demystifies the world of poetry and the hesitation some might feel towards poetry. FANCY NANCY POET EXTRAORDINAIRE! is a pure delight for children and even for parents to share with children by reading aloud. Sparkly glitter on the dust jacket creates a festive atmosphere alongside the Roman costumes worn by Fancy Nancy and company. A short anthology of 6 of Fancy Nancy's favorite poems is included. FANCY NANCY POET EXTRAORDINAIRE! includes several activities for children that can be done at home with the family or in the classroom. Best of all, while showing the fancy, fanciful world of poetry, Jane O'Connor also makes poetry real and approachable. FANCY NANCY POET EXTRAORDINAIRE! will appeal to a wide variety of children, but if by chance, you are a parent who is an English teacher or an author, this book is a must to share with your children!